The Birmingham Small Arms Company (BSA) in Small Heath, Birmingham (UK) were more famous for their side arms and Bicycles (BSA Cycles Limited). 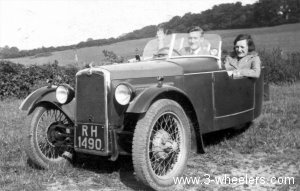 In 1929 BSA produced their first 3-wheeler; the BSA Beeza. The BSA used the “Hotchkiss” engine (a 1021cc, air cooled overhead valve vee-twin) to power its front wheels. The BSA publicly announced at the 1929 Motorcycle Show and was admired by many. 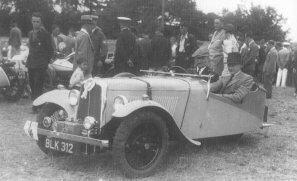 The car featured all-round weather protection, electric starter, and added to this the BSA performed well both on the race track and on the roads and its success led BSA to producing nearly two thousand models a year. By the end of 1932 BSA were offering six versions of the vehicle tailored to meet everyone’s needs and also as a serious attempt to rival Morgan. The cheapest of these was the £100 Standard two seater. The Family version, that had a family style body with an extra two seats in the rear for children, for £105 . 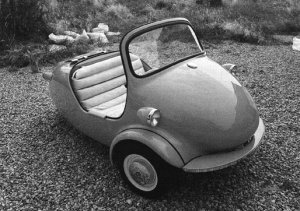 There was then the De Luxe two seater for £108, the De Luxe Family model for £110 and the Special Sports model for £115. BSA also produced an additional sports model for £125 that was fitted with a four-cylinder engine. In 1933 the company made slight alterations to the standard vehicle and upgraded the engine to 1100cc. In 1934 BSA introduced their new 4-wheeler, The Scout, and continued to produce 3-wheelers until 1936. It was not until the late 1950’s that BSA introduced their next 3-wheeler; the Ladybird. This however was essentially a prototype and never reached mass production. The first Ladybird prototype had a hand made steel body and was powered by an engine at the rear of the vehicle. The car was very basic and did not feature items such as spare wheel, traffic indicators or a windscreen wiper. Although basic the interest in the Ladybird promted a second prototype in 1960. This model featured a windscreen wiper and the half moon shaped handlebars in the first prototype had been replaced by a steering wheel type control with the control resembing the top third of a circle. Sadly due to the falling demand in microcars in general the Ladybird was abandoned in 1960.